Hello, I've been at our guild retreat all weekend, and am now just able to get Random.org to pick a winner for my Grow Your Blog giveaway. This was such a fun blog hop. I got to meet so many bloggers from around the world. It has been a pleasure to get to know them and see what they are up to. Welcome to my blog, again. I look foward to learning more about you in the year ahead. I am so in awe of all the talent out there. So why am I late picking a winner - well it was this retreat I went to. My first and was it fabulous! They had so many treats for us. It started at 3 PM Friday, but some of us had been there since 10 AM working on UFOs and WIPS ahead of time. To get us better acquainted with the other 23 quilters, we had a progressive dinner Friday night, then we went to the big room and started our first clue of our mystery quilt. Around 10 PM we had our first make and take - a darling bag that we could make in a mere 20 minutes. So useful and cute. The weekend was just great. Here's a photo of one of the many varieties of the mystery quilt (a Debbie Caffrey patter) - made various by our choices of fabric. Mary(she's behind the quilt - lol) was making the larger version - all this lacks is the outer border! 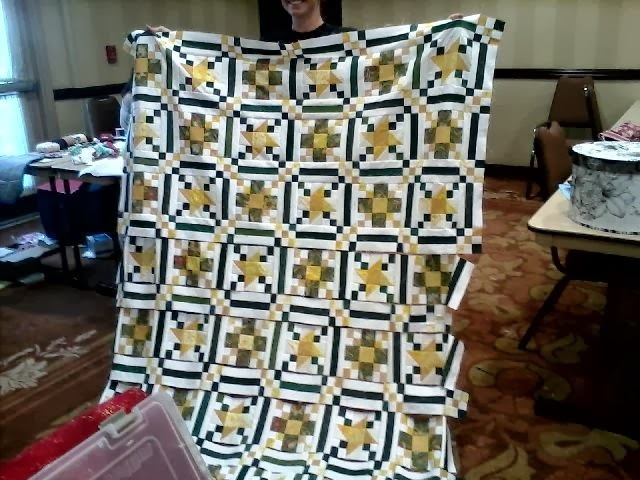 She was assembling the top using Elinor Burnes method of sewing rows and then adding the next row without separating the rows from their chain piecing - so saves time and misplacing blocks. "Oh dear, I think we are most certainly kindred spirits Angie! 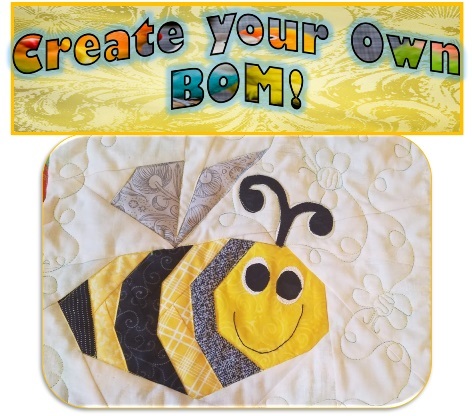 I love many crafts as you know from visiting my blog but applique is one of my favorite quilting techniques... and The Fat Quarter Shop, well, one need not say more! :D I am certainly not going to lose you now that I have found you through Vicki's party! :D I'm your newest follower! Hugs, Beth P" I've sent an email. Congrats Beth! Thank you to all who came by and commented during the blog hop, or became followers. I haven't been able to reply, but I'm saving the comments and will come visit you soon. 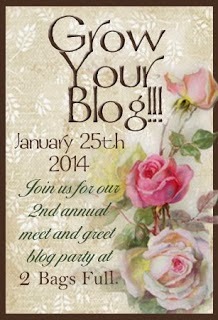 And thank you, Vicki, for a wonderful blogging event. 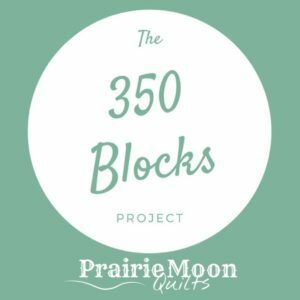 I did grow my blog! Congrats, to Beth P. So glad you enjoyed your first retreat with the guild. Welcome home! Retreats are always so much fun. I like that quilt. Did you make one? It certainly was a wonderful retreat !! I so loved it and we so loved your sage advice. Glad to hear about your retreat . I've only been on one. Was fun. Glad to be one your new followers too!